We are counted amid the well-known Rubber Cables Manufacturers in India. In keeping with the company's commitment to technological advancement, elastomer materials such as Polychloroprene (PCP), Chloro-Sulphoneted Polyethelene (CSP), Nitrile Rubber /PVC blends, Ethylene Propelene Rubber (EPR), Ethylene Vinyle Acetate (EVA) and Silicone have been specially compounded to meet numerous heat oil and fire resisting requirements. In the recent years, Relemac Technologies has also developed special Rubber Cables & Elastomeric Fire Survival Cables for power, control and instrumentation wiring. All our Elastomeric Rubber Cables available in standardized as well as customized specifications. 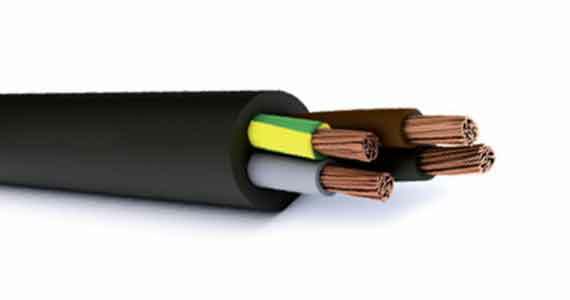 Additionally, the Elastomeric Cables are reasonably priced too. .
Elastomeric compounds for insulating and sheathing of cables are formulated to meet the requirement of IS 6380, BS 6899, IEC 60502 and other international specification. • The number of wires is approximate and wire diameter is nominal; they shall be such as to satisfy the requirements of conductor resistance as per Class 5 of IEC 60228 / DIN VDE 0295 / IS 8130 / BS 6360. • 4 core and 5 core flat cables are available on request. Material Max.Cond.Temp. for Continuous opertinuous operation Deg C. Max. Cond. Temp. For short circuit Deg C. Min. Working Temp. Deg C.
are used in electric utilities such as the generation and transmission of electricity. Long service life under normal environment in Nuclear and conventionally powered generating stations plus safety considerations are the significant factors of these electric appliances. When exposed to fire, Silicon offers circuit integrity, low smoke evolution, and freedom from halogen acids. (For e.g. High Furnaces Generator, Electrical Furnaces, Cokd Ovens, Driers, Bakeries & Blast Furnaces). Steel Mills, EOT Cranes, Airport Lighting, Ships, Nuclear & Thermal Power Stations, Wind Power Mills, Electrical Machines, Textile Machines, Construction Equipments, Turbines. • Based on CENELEC HD 22-6 31, VDE 0282 ,IEC 245-6, IS 473, BS 638-4. • Outstanding toughness & durability. • High resistance to cuts , tears & abrasion. • Resistance to oil , solvents and chemicals. • Excellent ozone and weather resistant. Welding: Designed for the secondary (high current) connection with automatic or hand - held metal arc welding electrodes. It is suitable for flexible use under rugged conditions, on assembly lines and converyor systems, in machine tool and automatically operated line and spot welding machines. Earthing/return leads, power feeds to electrolytic plating process, Busbar connection, transformers, generators, aircraft servicing equipments etc. Conductor: High conductivity, bare annealed copper flexible conductor. Sheath: Double sheathed with specially developed thermoplastic Elastomer (TPR/TPE), outer layer is orange coloured. When total cable lengths in excess of 15 meters, are involved , it may be necessary to use cables of larger cross section to ensure that the voltage drop is not excessive and welding currents are maintained at adequate levels.